Irish Supersport champion Derek McGee will make his Isle of Man TT debut in 2015, riding for the Wilson Craig team. The Mullingar man will campaign Honda machinery in the Superbike, Senior, Superstock and Supersport classes as he makes his bow on the Mountain Course. The 28-year-old was recently named as the replacement for Jamie Hamilton in the Londonderry businessman's outfit. 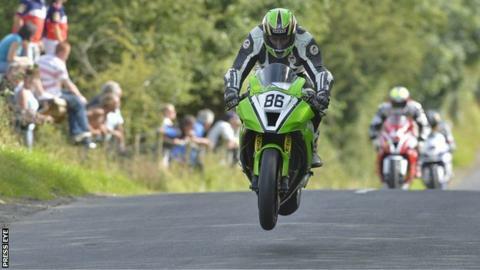 McGee's outings on the international road race scene have so far been limited to the Ulster Grand Prix. He has lapped at 126.607mph on the Dundrod course and was second in the 2014 Supertwins race. The Republic of Ireland rider has excelled on the Irish national road race scene, clinching the Irish Supersport Road Race Championship, helped by wins at Kells and Killalane, and podiums at Cookstown, Tandragee, Skerries, Walderstown and Faugheen. He also proved his Superbike capabilities this year with rostrum finishes at Cookstown, Tandragee and Kells, while he also finished second overall in the Supertwins championship. "The TT has been on my radar for some time and now feels like the right time to make my debut," explained McGee. "Teaming up with Wilson Craig Racing makes the process a lot easier of course, and their experience will be invaluable. "I've loved looking around the course and can't wait to ride it. I've had a lot of help from John Barton and Richard Quayle and I intend on doing as much homework as I can ahead of making my debut in May."